Marv Hubbard embodied determination and hard work, character traits that defined his performance on the football field and in life. Raised in Red House, he attended Randolph High School and went on to play his college football at Colgate University. At Colgate, he lettered three years, leading the team in rushing in 1965 with 665 yards and 1966 with 893 yards, at that time the second-highest total in Colgate history. 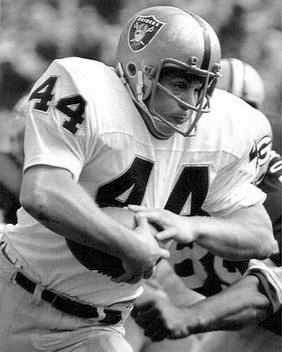 Selected by the Oakland Raiders in the 1968 draft, Hubbard played for the Raiders from 1969 through 1975. He was a three-time NFL All-Pro for the Oakland Raiders, and helped lead the team to four consecutive AFC Western Division titles from 1972-75 and into three consecutive AFC Conference Championship games from 1973-75. A fan favorite for his aggressive style and powerful tenacity, he was a key player in Oakland’s formidable rushing attack. Hubbard led the Raiders in rushing four straight seasons from 1971-74, and averaged over 1,000 total yards from scrimmage in each. His best season came in 1972 when he rushed for 1,100 yards on 219 carries with four touchdowns. In the 1972 season, he became the Raiders all-time single season rushing leader. He was also an effective pass receiver coming out of the backfield, catching 85 passes for 624 total yards in his NFL career, averaging 7.4 yards per reception. Hubbard scored 24 touchdowns (23 rushing, 1 passing) during his career, six of which were against his favorite opponent, the division rival Kansas City Chiefs. He is ranked fourth in NFL history for highest yards per carry (4.82) for a fullback and is ranked the 5th leading rusher in Raiders history with 913 carries for 4,394 yards. His career yards per carry average was higher than many of the games legendary running backs, including: Walter Payton, O.J. Simpson, Eric Dickerson, Emmitt Smith, and Marshall Faulk. In 1977 Hubbard signed with the Detroit Lions, where he saw reduced play, and then retired. In 1995 Hubbard was inducted into the Colgate University Athletic Hall of Honor. In retirement Marv tried his hand for a brief period as a country musician and songwriter and released the single “Fullbacks Ain’t Supposed to Cry” in 1978 and “Legend in His Own Mind/Country Boogie” in 2009. Hubbard went on to become a general contractor and owned his own business. . Marv Hubbard passed away in 2015.